It's been about a month since we sent out the call for artists for our first ever team Art Gallery Show...and let me tell you! The applications poured in. You can tell how much we all love being part of this community and support each other. Now that applications are complete... I'm pleased to announce that over 60 artists were accepted into the team show by the gallery to be part of the team show!!! That's over 10% of our team participating under one roof. 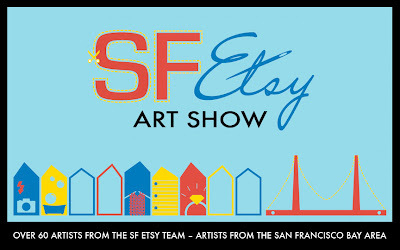 This show is for SFEtsy Team Members only. Over 60 artists will be featured! We will be having a networking Meet-Up event at Studio Gallery later on in the month. So, if you can't make it to the reception....this is another opportunity to mingle with team mates while you strengthen our community by making and trading ATCs (Artist Trading Cards). More to come about this event on the blog and online soon! Keep an eye out for it! It will be a fun Meet-Up. Rochelle Foles is the organizing leader to contact if you'd like to volunteer or want more information. Find her contact information on the new leadership page. A HUGE THANK YOU TO STUDIO GALLERY - they are letting us use this space free of charge and have been a HUGE help in the planning of this spectacular event. Congrats to all who will be participating in our first team Art Show!!! What a great list! My name is not a link to my shop???? Diana Willis. I know I sent the team my info and I've been a member for a couple of years. Hi Diana :) I know you've been a member for some time. We just received the list with names, not shop names. The blog has been updated with your link. Thanks for understanding. Looking forward to participating. Just noticed I am linked to an incorrect shop name, one I am not using, please change to show this one: http://www.rhealeanne.etsy.com. Thanks!